United Airlines plans to launch non-stop summer seasonal service between Chicago O’Hare International Airport and Scotland’s capital Edinburgh on May 22, 2014, subject to receiving government approval. If approved, United Airlines’ proposed Chicago-Edinburgh flights would represent the first scheduled non-stop service between the two cities. The flights will operate five times weekly from May 22 to June 11, daily between June 12 and September 1 and four times weekly between September 2 and October 5, 2014. “In addition to providing a direct link between the two cities, the new flights are conveniently timed to provide connections in Chicago to and from more than 125 destinations across North, Central and South America and the Caribbean,” says Brian Znotins, United’s vice president of network. United’s flights will depart Chicago O’Hare International Airport (IATA code ORD) at 6:00 p.m., arriving at Edinburgh Airport (EDI) at 7:45 a.m. the following day, local time. The return flights will leave EDI at 10:25 a.m., landing at ORD at 1:00 p.m. the same day, local time. Flight times are seven hours, 45 minutes eastbound and eight hours, 35 minutes westbound. 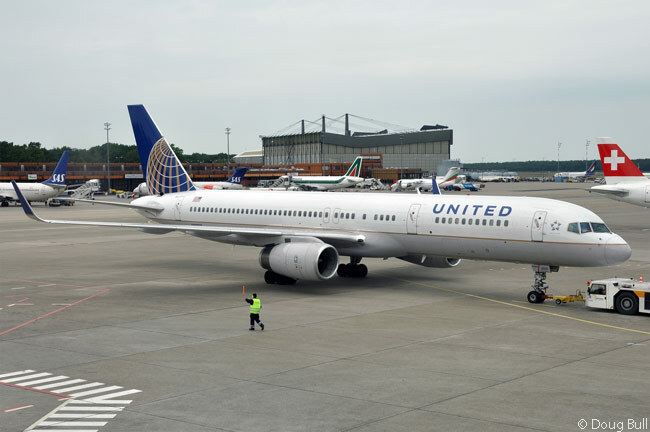 United will operate the flights with Boeing 757-200 jets, each with 169 passenger seats – 16 flat-bed seats in United BusinessFirst and 153 in United Economy, including 45 Economy Plus seats with added legroom and increased personal space. Chicago-headquartered United offers more non-stop service to more destinations from its Chicago O’Hare hub than any other carrier and has added 11 new routes from Chicago since the beginning of 2013. United already operates year-round non-stop service from its New York-area hub at Newark Liberty International Airport to both Edinburgh and Glasgow, having started service to Scotland in 1998.